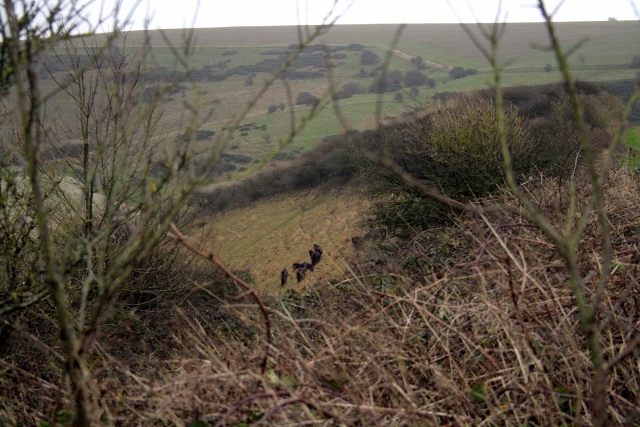 Exmoor ponies sheltering from gales to south of dig site. A damp windy morning was spent up on the Newmarket Farm dig site. Fortunately we were able to experience first hand how well sheltered the site was from a south-westerly gale. Looking NW to N of front garden gateway. Looking N at original ground surface N of garden gateway; click for enlarged image. Looking S at area N of front garden gateway; click for enlarged image. 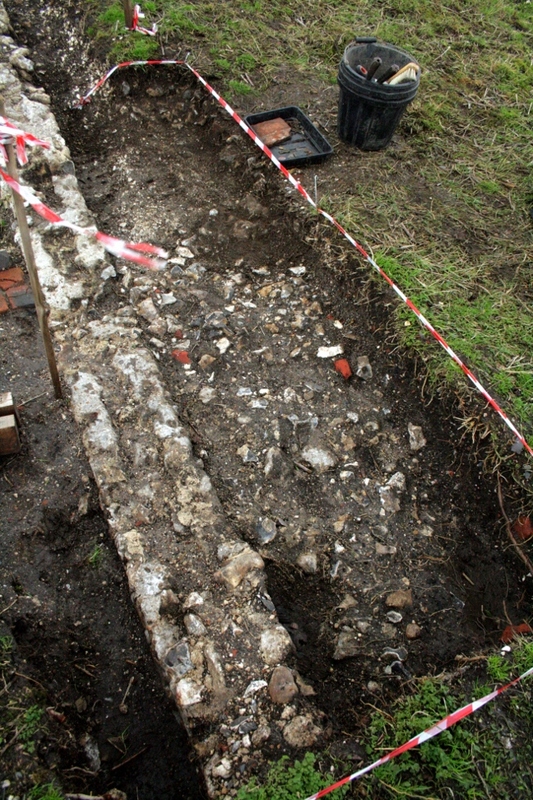 The last part of the trench to the north-west of the front garden gateway was excavated. The demolition fill was very shallow over both the chalk rubble fill next to the front garden wall and the badly laid flints of the cobbled path surface which curved round to the north-west. Finds were not plentiful, a small variety of rusty metal, including the noses of three .303 bullets, a few small ceramic and glass shards, including a yellow (mustard) coloured bead, a small piece of butchered bone, and some dark red shards of a thin hard plastic (bakelite?). Looking SSE at E side of cottage. 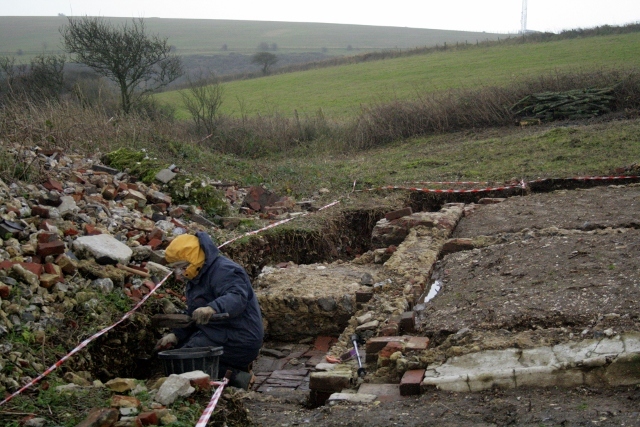 The outside of the shed wall was cleaned up, as well as could be done, for it is extremely close to the edge of the trench, and contains large blocks of demolished masonry at the base of the rubble mound. Finds were few and not worthy of note. Finds were also retrieved from other areas where they had been washed out of the ground by the recent stormy weather. The best, from in front of the cottage, was the hind quarter of a small lead horse in harness. 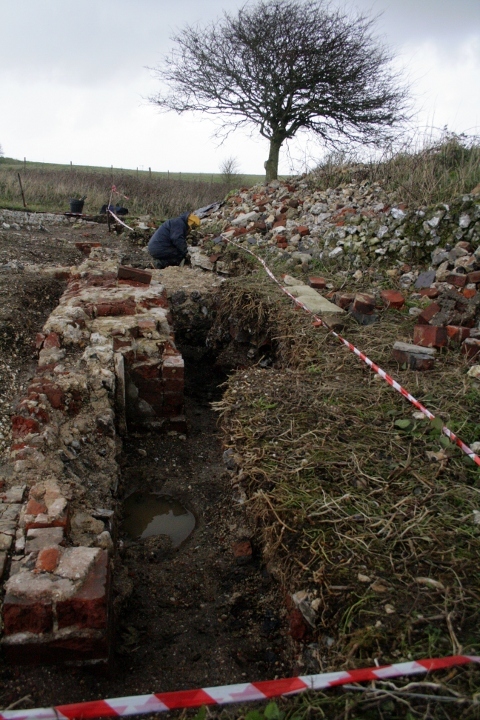 The bricks excavated during the course of the dig were attempted to be categorised. They were hand-made bricks, with and without shallow frogs, with and without a blue glaze. Confusingly, every brick measured was of a different size. Was this merely because they were handmade, or were they different types of bricks? The fabric of the majority of these bricks seemed identical, but it would take a lot of time and effort to take the measurements of enough bricks to fully answer to this question. More time than I have available. Whilst we wait for a window in the weather, guaranteed to be dry for the 3-d laser scan, there are still plenty of opportunities to dig. We would love you to join us – either for a site visit, or to help us dig – no experience required! We meet at the car park near the junction of Bexhill Road and Falmer Road, just north of Woodingdean. *Please note* in future we will only be digging Sundays, from 10am – 3:30pm. Fridays will be dedicated to re-surveying the site. If the weather is too bad to dig we are still happy to give a quick tour for anyone interested. Please don’t hesitate to email for further info.